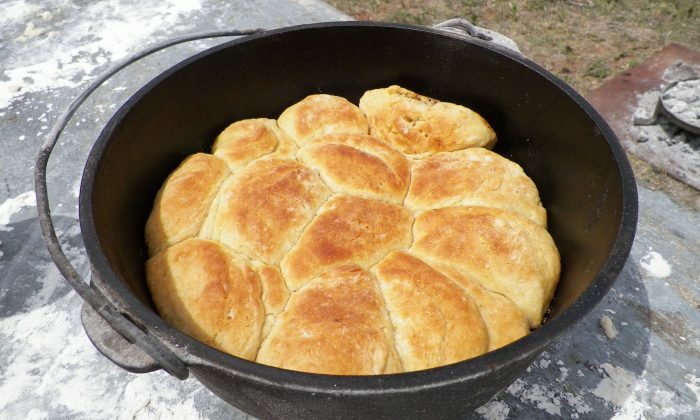 Sourdough was a staple in old cow camps because milk and buttermilk were hard to come by on the trail. Along with beans and coffee, biscuits were about all a cowboy was going to get. This started out as Grandma’s recipe that I tweaked so they turn out light and fluffy. The biscuits have a sweeter and softer sourdough flavor than traditional San Francisco sourdough. Be sure not to overwork the dough. Like I always say, the only time I “knead” biscuit dough is when I’m broke! Preheat the oven to 350 degrees F with a rack in the middle. Butter a 9 x 13-inch baking pan or 12-inch cast iron skillet. In a large bowl, dissolve the yeast in the starter. Whisk in 4 tablespoons of the sugar and let sit for 1 minute. Whisk in the oil, baking powder, and salt. At this point, taste the starter. If it is too tart, add a little more sugar, to taste. Remember, the first time you use the starter, it will be the sourest. Slowly begin stirring in the flour until it makes a soft dough and is no longer sticky. Turn the dough out onto a floured surface and roll out to about 1/2 inch thick. Cut out about 16 rounds with a biscuit cutter and place on the baking pan or skillet close together. Cover the biscuits with a buttered piece of wax paper and let rise in a warm place for 40 minutes to 1 hour, or until nearly doubled in size. Uncover the biscuits and bake for 20 to 25 minutes, or until golden brown. Brush with melted butter and serve warm. Sourdough is like my old hat; it has many uses and fits in a lot of different situations, from biscuits to pie crusts to battering meat. You can even substitute it in any recipe that calls for milk or buttermilk. This sourdough is a tad sweeter and a whole lot easier to keep than most. Traditional sourdoughs are like needy horses. You have to feed them, read them a bedtime story every night, and feed them again. But you won’t have to feed this one constantly, and it’s ready to go in 12 hours. It was a staple for old Cookie on the trail, and it’s still used on my wagon today. Add the warm water to a crock jar that holds at least 1 1/2 gallons. This will prevent the starter from frothing over while it’s setting up. Whisk in the yeast and sugar and let sit for 1 minute. Slowly whisk in the flour. Drop the potato pieces into the bottom of the crock jar. Cover with a tea towel and let sit on the counter for at least 12 hours, stirring halfway through. You can let the starter sit longer for a more sour flavor. Before using the starter in a recipe, whisk it briskly until smooth. Tip: The starter will be sourest with its first use, so you may want to add a little more sugar to the first recipe you use it in. I typically keep this starter for a week at a time, stirring at least once a day. However, you can keep it as long as the potato stays intact. I prefer to use a russet potato because it holds up the best, but you can use any potato you have on hand. Always cover the starter with a towel and never refrigerate it. When you have used 3 cups of the starter, whisk all the ingredients into the jar. The starter is ready to use again, or you can let it sit for six to 12 hours to create a more tart taste. Reprinted with permission from “A Taste of Cowboy, Ranch Recipes and Tales from the Trail,” by Kent and Shannon Rollins (Houghton Mifflin Harcourt, 2015).